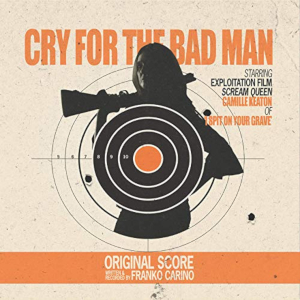 Franko Carino – DJ and one-time touring musician with rap rock band Limp Bizkit – has turned his hand to composing for film, providing a synth score for the ‘home invasion’ thriller, Cry For The Bad Man. Camille Keaton (I Spit On Your Grave) stars as a widow who has to deal with a trio of violent extortionists who come visiting her in her isolated rural home. The album opens strongly with a couple of tracks that features strong ostinato patterns with meaty-sounding synths and various subtle tinklings to add some depth (“It Begins”, “Good Evening”). Unfortunately, it’s not long before these Carpenter-esque tracks are replaced with more ambient-heavy efforts and the listening experience gets bogged down in the various meandering synth washes and industrial gratings of the album’s middle tracks (for example, “Getting Ready”). There’s very little tension or peril generated in these ambient tracks. In occasional moments when the score attempts a more orchestral feel with the introduction of synth strings, their artificial sound diverts the attention away from the music and focus more on the quality of the sound of the synth instruments. There are hints to what might have been (in terms of generating an emotional response) on the album. A stripped back piano motif makes an appearance and gives a sense of tension and peril but it’s soon overtaken by brash electronic gratings which strips away any sense of atmosphere (“The Mirror”). The album can be purchased HERE or at other online stores as a digital download or to stream.